It’s somewhat ironic, but often it’s the pieces that I’ve had to think twice about before purchasing at opshops that end up being my favourites. 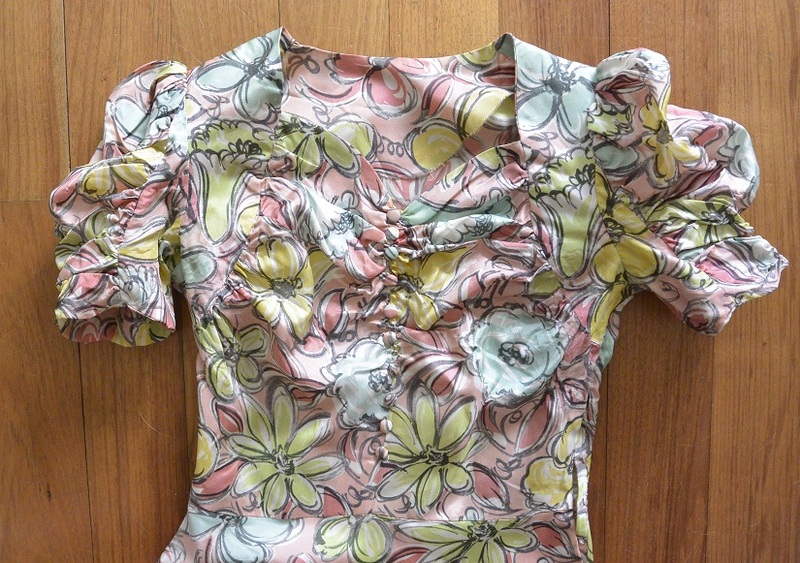 Case in point, this fabulous floral frock that I found for $10 at Bargain Browser. There is a lot going on in this dress – bias cut skirt, ruched sweetheart neckline bodice with buttons and ruched, full sleeves. 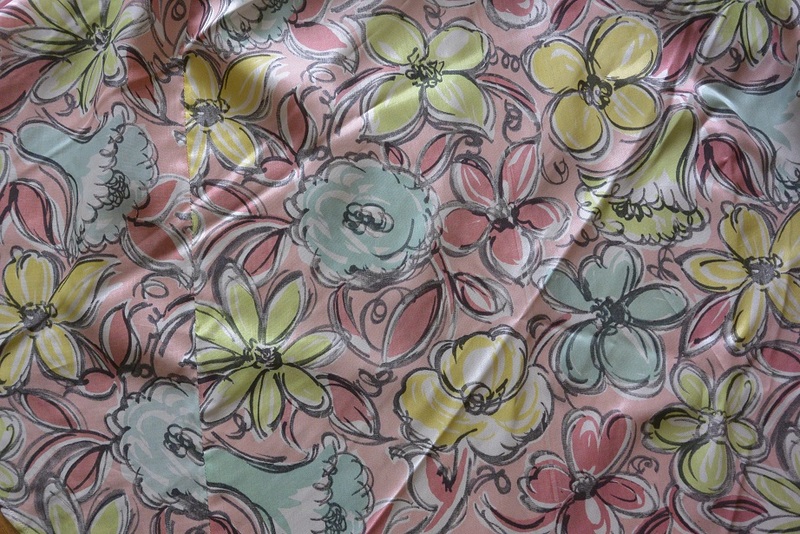 Plus the big flowers all over a pale pink background. Totally not what I would normally wear, but when I tried it on and it fitted PERFECTLY, well, I couldn’t just leave it there. It did need a good pressing as it was all wrinkly and seems to be made from a material that is extremely prone to crushing and crinkling. Ironing makes such a difference to clothing’s appearance (and rack appeal), as any seasoned opshopper knows! As with so many things that I find at opshops, I would love to know more about this one – the seams have been left raw, and the side opening has press studs and hooks & eyes rather than a zip. The style is very 1930s, which fits with the raw seams and no-zip factors, but could it really be that old? 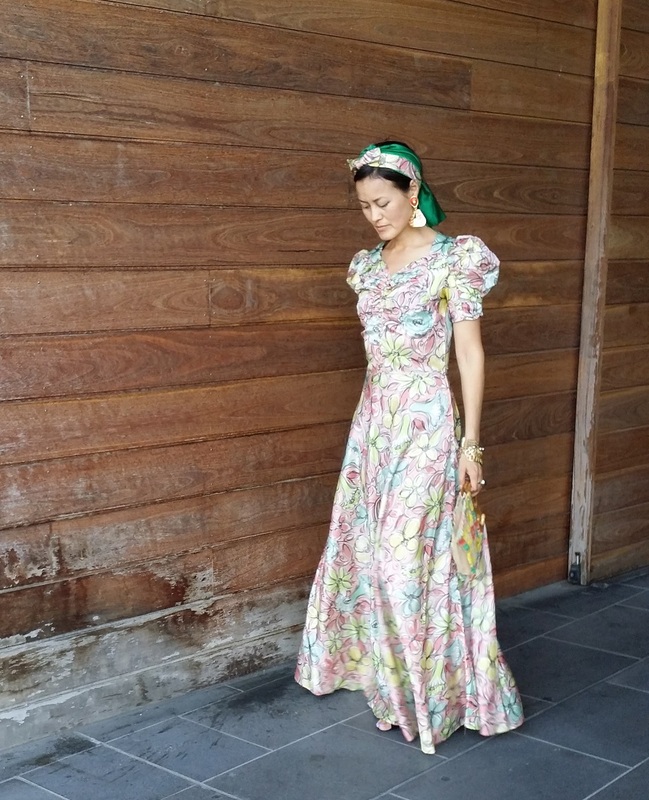 I’m inclined to think it’s more likely to be a more recent version that was made using a vintage/vintage-inspired pattern, and perhaps the seamstress was in too much of a hurry to finish things off neatly or didn’t have access to a zigzag stitch or overlocker. Thoughts? Probably because they know I usually can’t resist fiddling with things, various people have asked if I’m going to alter this dress, or even just take up the hem as it is quite long and I could trip on it (given how clumsy I am, that is a genuine concern!!). But once I’ve got heels on, the hemline pools perfectly on the floor, and it’s not like I’m going to be hiking through mountain ranges in it or anything like that. 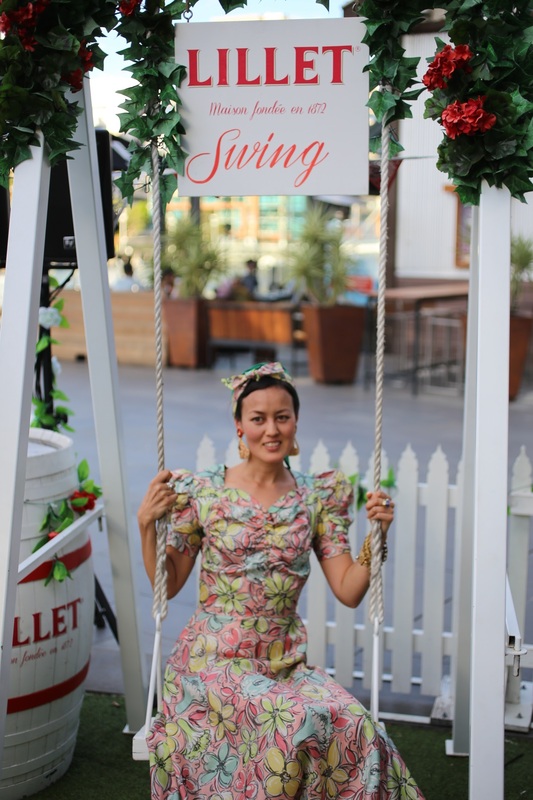 The most active thing I’m likely to do is get on a swing at a garden party, and it turns out to be the perfect length for that (thanks to The Prosecco Queen for this shot taken at the Lillet Secret Garden Party cocktail event held at Common Man in South Wharf last week). Admittedly, I did fiddle a bit with the styling – I needed something on my tiny pin-like head to balance out the big sleeves, so I tied on a green silk scarf and then knotted the fabric belt over the top of that. How I’d love to know how the original owner styled her hair when she wore it! I know I’ve got readers in the Ringwood-ish area so maybe this belonged to your aunty or grandma? If you happen to know, drop me a line. 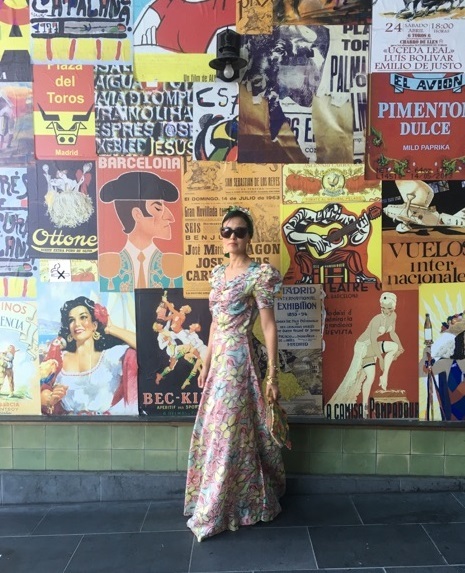 Stranger things have happened – this weekend I was at Fitzroy Market and found this dress I’d previously got from a clothes swap at one of the stalls (for some reason I didn’t end up wearing it often so I reswapped/donated it). Don’t you love it when clothes bring joy to so many owners? Maybe special dresses like these should have a little label inside so that each owner can add their details to track the wearing history. It would be a lovely way to connect ladies who obviously share exquisite taste!